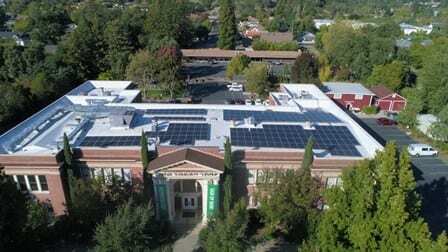 Novato and Sonoma based SolarCraft recently completed the installation of a 41 kW DC solar panel installation at the newly constructed Station 2 Menlo Park Fire Department, Menlo Park, CA. The solar panel system will save the Station over $250,000 dollars in energy fees over the next 20 years. Designed and installed by SolarCraft, the solar photovoltaic system is mounted on the top of a two-story standing-seem roof and consists of 126 American-made, Suniva 325-watt solar panels, providing 53,700 kWh of sustainable solar power annually. The excess energy is fed back to PG&E, reducing the energy pressures on the local power grid. SolarCraft was selected for their expertise and ability to design and engineer a system to meet the unique demands of the Fire Station for a high-performing reliable system with low operating costs and risks. Over the life of the system 420 tons of carbon dioxide will be eliminated from the Station’s carbon footprint, which is the equivalent of removing nearly 1 million miles of driving over the next 25 years. That’s also comparable to the air pollution removed by more than 3 acres of trees. The Menlo Park Fire District, which also serves East Palo Alto, Atherton and unincorporated areas of the county, turns 100 this year. Adding solar and other energy efficiency measures is part of the plans for new construction to grow resources. The newly built Station 2 is critical because it covers an area expected to see the most development over the next 20 years.